A bold new approach to writing (and reading) poetry based on great poetry of the past.Quick, joyful, and playfully astringent, with surprising comparisons and examples, this collection takes an unconventional approach to the art of poetry. 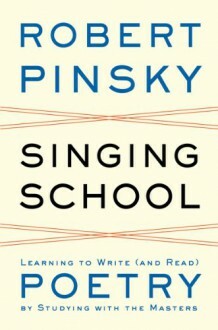 Instead of rules, theories, or recipes, Singing School emphasizes ways to learn from great work: studying magnificent, monumentally enduring poems and how they are made— in terms borrowed from the “singing school” of William Butler Yeats’s “Sailing to Byzantium.” Robert Pinsky’s headnotes for each of the 80 poems and his brief introductions to each section take a writer’s view of specific works: William Carlos Williams’s “Fine Work with Pitch and Copper” for intense verbal music; Emily Dickinson’s “Because I Could Not Stop for Death” for wild imagination in matter-of-fact language; Robert Southwell’s “The Burning Babe” for surrealist aplomb; Wallace Stevens’s “The House Was Quiet and the World Was Calm” for subtlety in meter. Included are poems by Aphra Behn, Allen Ginsberg, George Herbert, John Keats, Mina Loy, Thomas Nashe, and many other master poets. This anthology respects poetry’s mysteries in two senses of the word: techniques of craft and strokes of the inexplicable.